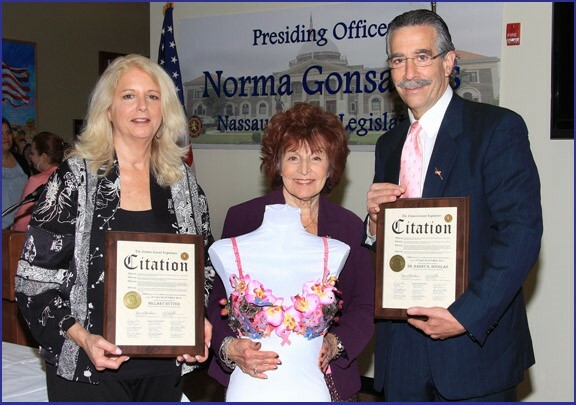 Presiding Officer Norma L. Gonsalves hosted a Breast Cancer Awareness Press Conference, in conjunction with Adelphi University, to promote the University’s Creative Cups Project. The project encourages artistic expression in celebration of the lives of those living with breast cancer and those we have lost to this terrible disease. Participants design and build original works of art using bras, which are exhibited and auctioned at a Gala reception in the spring. All the money raised will go to offset the costs of running the Adelphi NY Statewide Breast Cancer Hotline and Support Program. Pictured (l-r): Hillary Rutte,; Executive Director, Breast Cancer Hotline and Support Program; Presiding Officer Norma Gonsalves; and Dr. Barry Douglas, L.I. Plastic Surgical Group, PC.